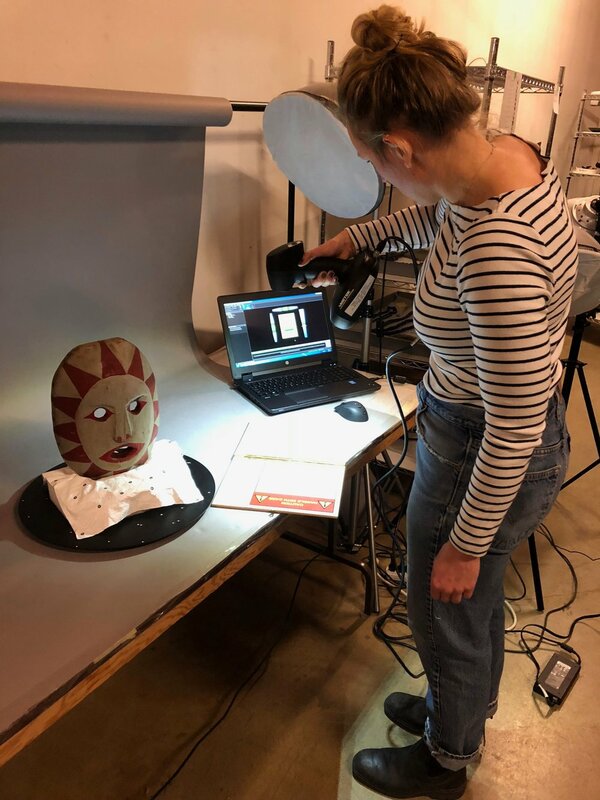 I recently had the opportunity to work with some wonderful people at the Museum of Vancouver, to explore the potential of 3D scanning the many artefacts they have in their collection. This opportunity is in acknowledgement of that we live and work on the unceded traditional territories of the Coast Salish peoples of the Katzie, Kwantlen, Kwikwetlem (kʷikʷəƛ̓əm), Qayqayt, Musqueam (xʷməθkʷəy̓əm), and numerous Stó:lō Nations. I worked along side Hannah Turner PHD, a Postdoctoral Fellow at the School of Interactive Arts & Technology (SIAT), and Wendy Nichols, the curator of collections at the Museum of Vancouver, who handled the artefact. This work was conducted with the permission of the Museum of Vancouver, and focused on replicating objects for education program use, use in exhibits, as well as documenting objects that may be loaned out and undergo change over time. 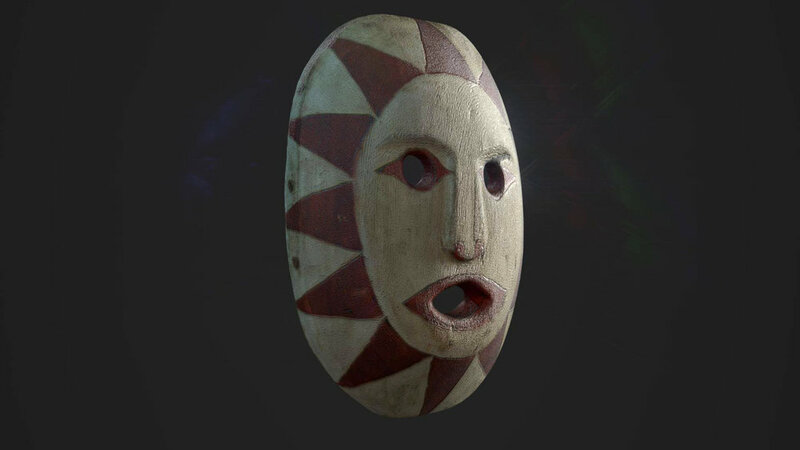 For this study, we used the Creaform 3D scanner, and our subject was a Mask by August Jack Khatsalano, who was a a Skwxwu7mesh spiritual leader and oral historian from the Vancouver area. This is a style of mask that was made and used for public performances. It may have had a ring of feathers around the outside at one time. Mask by August Jack Khahtsahlano - Scanning Setup for the first flat scan, face up. It was a pretty great first test subject for the purpose of 3D scanning, for several reasons. It has a very readable surface quality for scanning, with a lot of texture in the paint and wood grain, and hardly any specularity. It is a fairly simple shape, a nice solid form, without any intricate details. The Creaform 3D scanner requires pretty minimal setup, although calibration is a bit tricky, requiring a steady arm and some patience. The Creaform 3D scanner casts 3 lights out from it's nodes, so it does not require any extra lighting. You are required to put down some registration stickers and various surfaces surrounding your object, which can be reused in future projects. These stickers are picked up by the scanner, to help it understand where it is in the 3D space. Other than that we simply had a grey paper backroll, which we maybe should have swapped out for a white or black one, considering the mask was mostly grey. Hannah Turner PHD, wielding the Creaform 3D scanner during our 3rd Upgright scan of the object. Once the Creaform 3D scanner is calibrated, and you boot up the accompanying software, the scanning process is very straight forward. It is good form to making slow, deliberate movements with the scanner, always making sure as many of the registration stickers are visible in the view finder of the scanner as possible, with the scanned object as well. It is very forgiving, as you can pass over the same areas several times, collecting more data and detail with each pass. Occasionally the scanner can get lost if you don't aim it at the registration stickers for a while, but for the most part, we were able to scan the Khastalano mask from several orientations successfully. We positioned the mask flat on its back for the first scan, and then on its front for the second. The third scan we positioned the mask upright, and tried to capture as much as we could in one pass. This process took 2 hours to conduct 3 scans. Raw Scans Front Render - Front, Back. Raw Scans Back Render - Back, Front. After the scanning was finished, we had two sides of the masked scanned, and needed a solution for stitching them together. There was some clean up of the scanned geometry to be done, such as parts of the surrounding support for the mask during the scanning, and the background, but nothing too major. The raw scanned objects were hundreds of thousands of polygons, some of which were in strange positions, as a result of some scanning glitches. So we needed to clean up the topology of these scans. This clean up process took about 2-3 hours to complete. Alligned Front and Back scan results. After the clean up phase was completed, I used the 3rd upright scan, to ensure that my alignment of the front and back scans of the mask was correct. Once the front and back sides of the mask were aligned correctly, I then retopologize the mask using quad draw in 3DS Mask. This method allows you to pick any surface, and draw polygons across it on the fly. I had done this many times before, but have forgotten how much fun it can be. I used a polygon density and weight and offset to be as true to the original geometry as possible. There were some areas in which the scan had difficulty, mostly around the edge transition between the front to the back side of the mask. This is because the laser scanning just had a hard time evaluating the full object when we had it laying flat, and it sometimes has a hard time around sharp edges. I knew when I baked the textures though that this wouldn't be much of a problem. The result retopologized mask is about 3000 polygons, which I then UVW Unwrapped, to obtain texture coordinates for the baking process. It took 8 hours to complete. Retopologized Mask overlaying the raw scans. This is the basic setup for how to Bake the textures of the raw scans onto the retopologized mesh. I then brought the retopologized mask and raw scans into Substance Designer, where I use the Render to Texture Baker, to capture all of the detail of the scanned masks, and project it all onto my reptopologized mask, capturing all of the fine detail of the scans. With the baked textures, I authored a unified normal and roughness map in Substance Designer as well. There were still a few areas where the scanning had difficulties, like in the eyes and mouth, so I then imported all of the previous work into Substance Painter to fix all of the errors, of which there weren't many, by hand. This process was very quick, only taking 2-3 hours to complete. Mask by August Jack Khahtsahlano - Results After Baking, Wireframe + Textures. I would conclude that using the Creaform 3D scanner is a quick and reliable way to produce 3D digital artefacts. From start to finish, the process took 2 and a half working days. 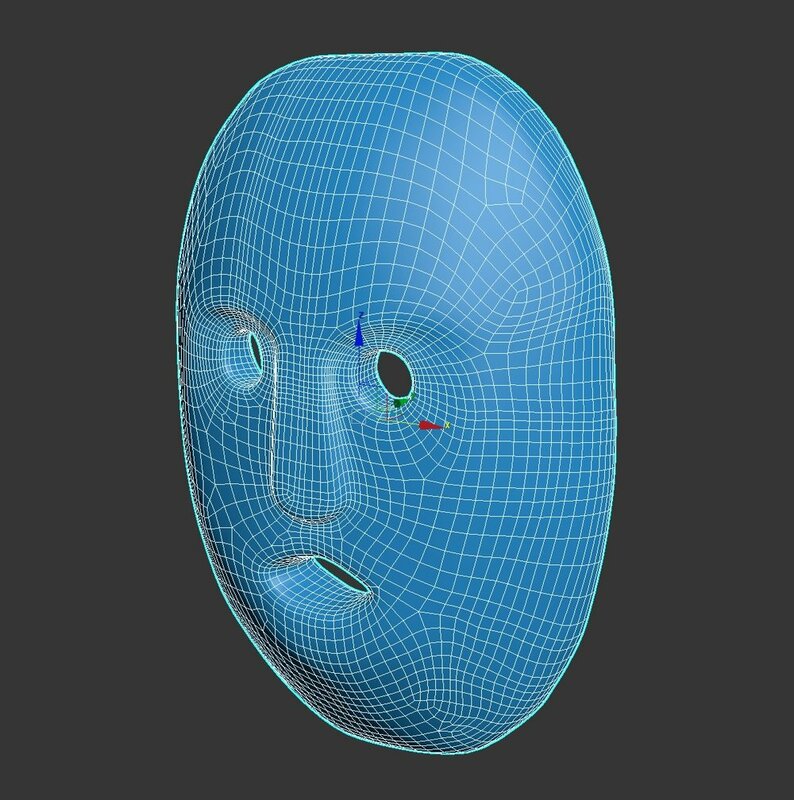 There are perhaps more ideallic setups for capturing the entire mask in one pass - better supports can be made to support the mask during scanning - however this setup proved that its feasible and quick to composite and bake several scans together onto a retopologized mesh. I felt that we really did the mask and the author justice with the scan, as little of the detail of the original object was lost in the process of creation. I look forward to doing more of this kind of work in the future!